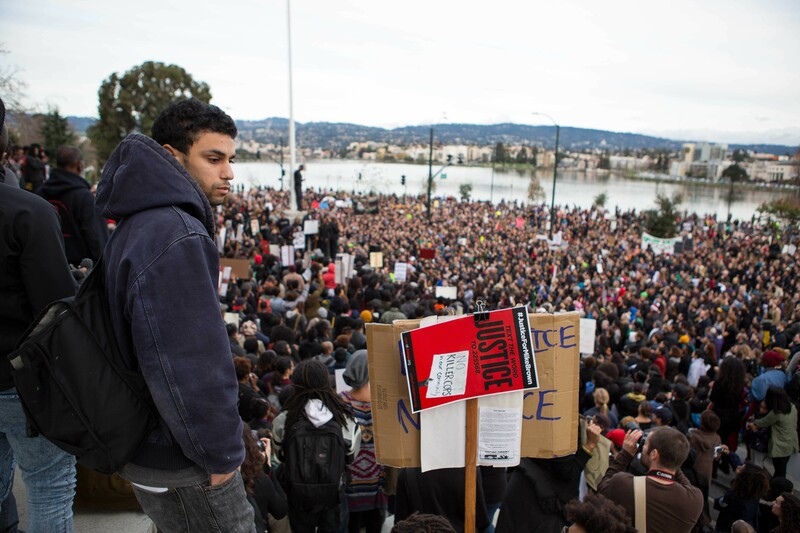 The Millions March drew about 3,000 protesters to downtown Oakland on Saturday. 1. Anti-police-brutality protesters chained themselves to the Oakland Police Department headquarters in downtown, SF Gate reports. The morning demonstration caught police by surprise. The protest followed the huge Millions March protest on Saturday, which drew about 3,000 peaceful protesters to downtown during the day, before the demonstration turned ugly again at night when a small group of protesters started vandalizing businesses. 2. California needs at least five to six more so-called hellastorms like the one that struck last week in order to emerge from the drought, the SacBee$ reports. Although last week’s big storm brought plenty of rain to the state, it didn’t snow as much as weather forecasters had hoped in the Sierra because of warm temperatures. 3. Criminal justice experts and activists are increasingly calling for an end to the use of secret grand juries in police-involved fatality cases, the Chron reports. 4. Diesel pollution has dropped dramatically at the Port of Oakland since the port began requiring truckers to install filters on their rigs, the Trib$ reports. 5. And the massive spending bill known as Cromnibus that was approved by Congress over the weekend includes provisions that would weaken Dodd-Frank, the federal bank regulation law, and significantly increase the amount of money that big donors can give to political parties, the Huffington Post reports. President Obama is expected to sign the legislation.